Goldfish have become one of SA’s best live acts, bringing their good vibes to people all around the world. And after many years of performing in their hometown of Cape Town, their summer residencies are now of the highlights of the clubbing calendar in South Africa. 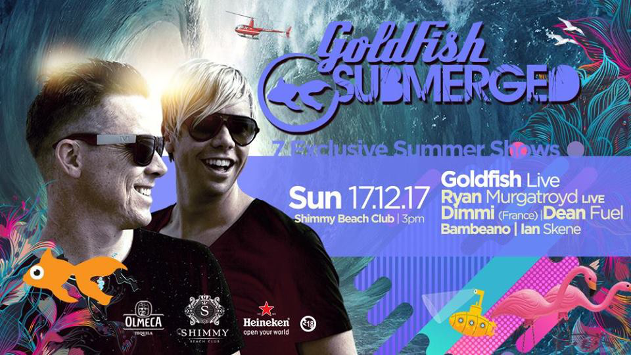 With a massive opening party last week, the Fishies are back for another season at the beautiful Shimmy Beach Club, combining feel-good house music with a beach-side vibe like no other. The opening party saw Kyle Watson, Dean Fuel, Jet Treger, Thank Me Later and The Fogshow support the well-known duo. And this week, Bambeano, Ian Skene and French DJ Dimmi will be added to the line-up, with SA favourite Ryan Murgatroyd performing his much sought-after live set to the sun-kissed revellers. Submerged Sundays will take place every week until January 7th, with a fresh supporting lineup for each event. Visit the Shimmy Beach Club page for more information.